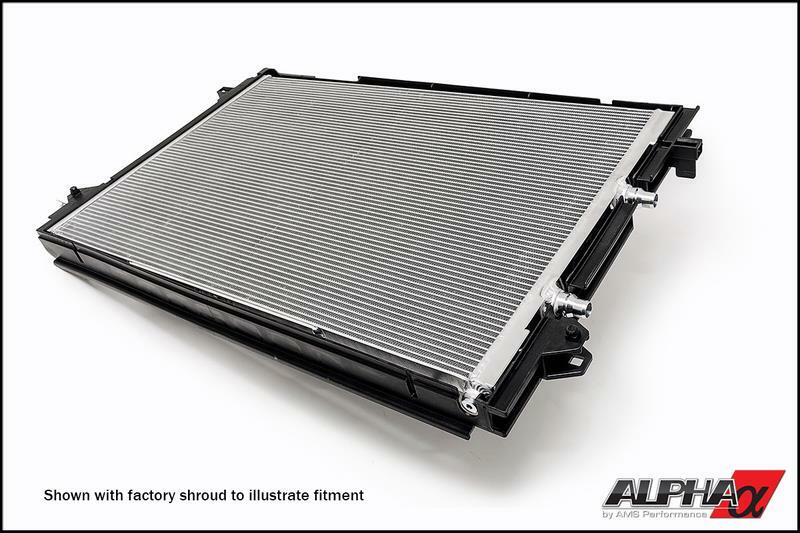 Whether you live in a hot climate area, enjoy long spirited drives in the mountains or long high speed pulls on airstrips, the Alpha Performance BiTurbo Primary Heat Exchanger Upgrade will help keep your intake temps lower and maintain your AMG’s maximum power output no matter the ambient conditions. The 5.5L BiTurbo engine does not use the typical intercooler you may be used to. Like many modern turbocharged European vehicles this V-8 twin turbo engine uses coolant to cool the intake air charge through an air to water heat exchanger. While this method works well it can quickly become heat soaked, robbing horsepower. 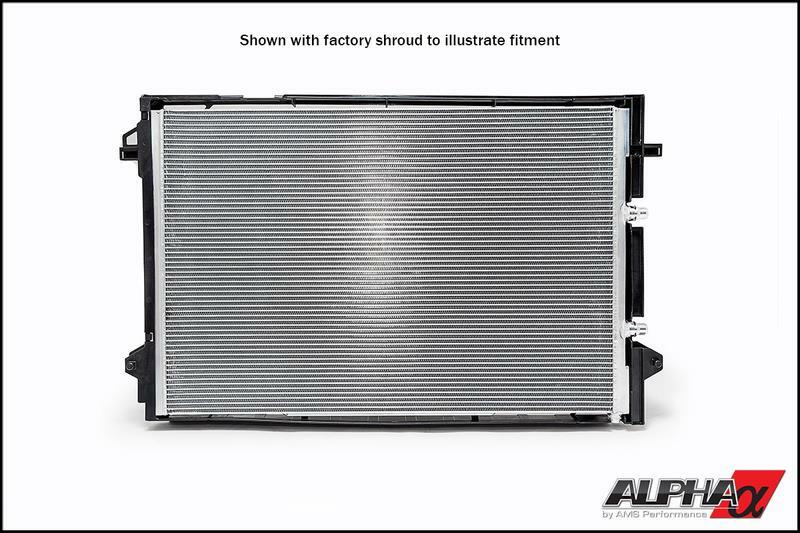 We found through testing, the factory Mercedes-Benz center heat exchanger was very flow restrictive on the water side. 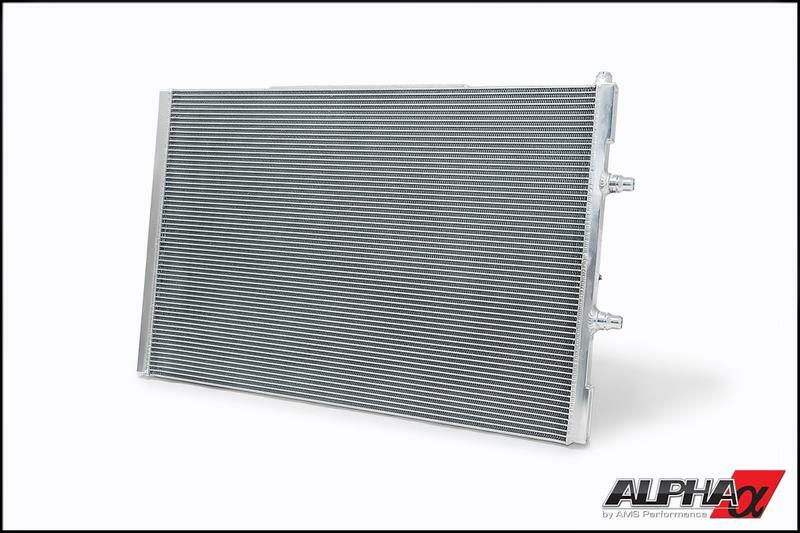 This was hurting the heat rejection of the water side of the intercooler – causing less efficiency and choking up the power output of your M157 engine. 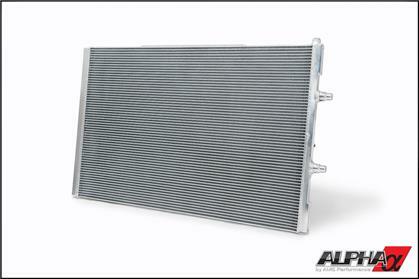 For the core, we chose a motorsport quality heat exchanger core. 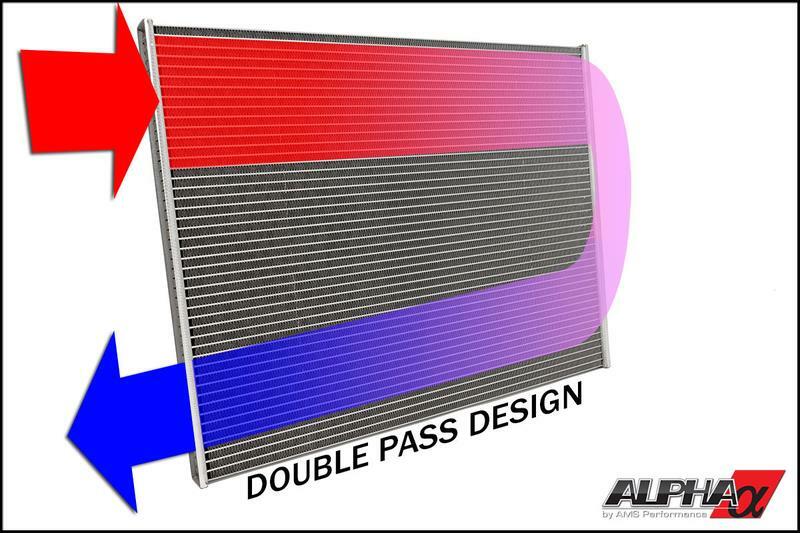 This high efficiency, dual pass core is much larger, featuring an additional 19 tubes (61 vs 42 stock) dissipating heat quickly for maximum cooling. 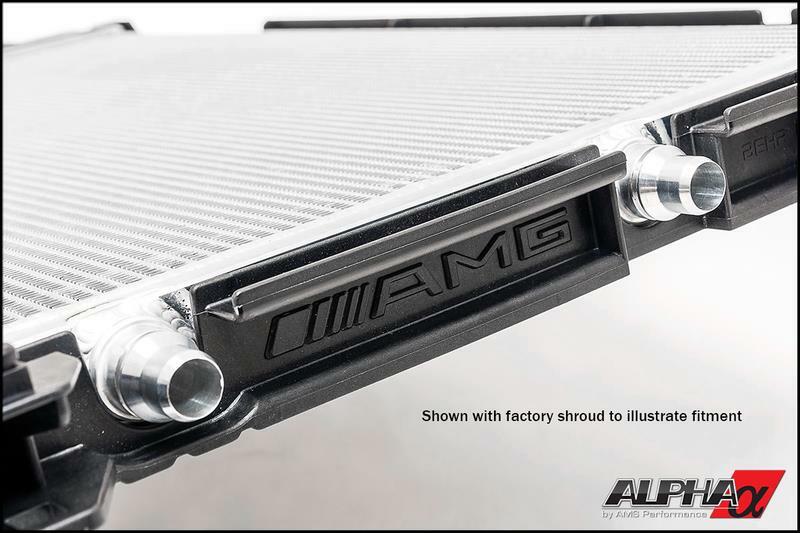 Through a larger design, added fluid capacity and drastically increased flow, your 5.5L BiTurbo engine benefits from reduced intake air temperatures (IAT) boosting power output. While the coolant inlets that mate to the Alpha CNC billet end tank use the factory hose fittings, we made the inside diameter larger to increase the flow rate. The inside of these fittings flare out, creating a nice flow path for the water. Our Engineering Team set out to make this heat exchanger upgrade not only more effective, but simple to install. It fits just like stock without any cutting or drilling. By using the factory lines and mounting points, the core simply slides and locks into place with no need for modifications. You don’t get a cleaner installation than that! 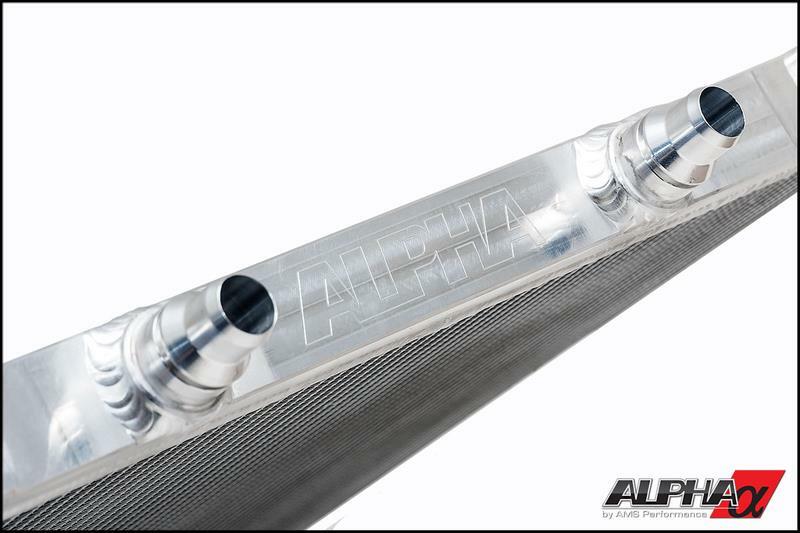 If you desire further boost intercooling with an Alpha 7 or Alpha 9 package, this Alpha Heat Exchanger is compatible with our full Alpha Boost Cooler System (E63, CLS63). This system adds an additional cooler, pump and reservoir for the ultimate in cooling ability.